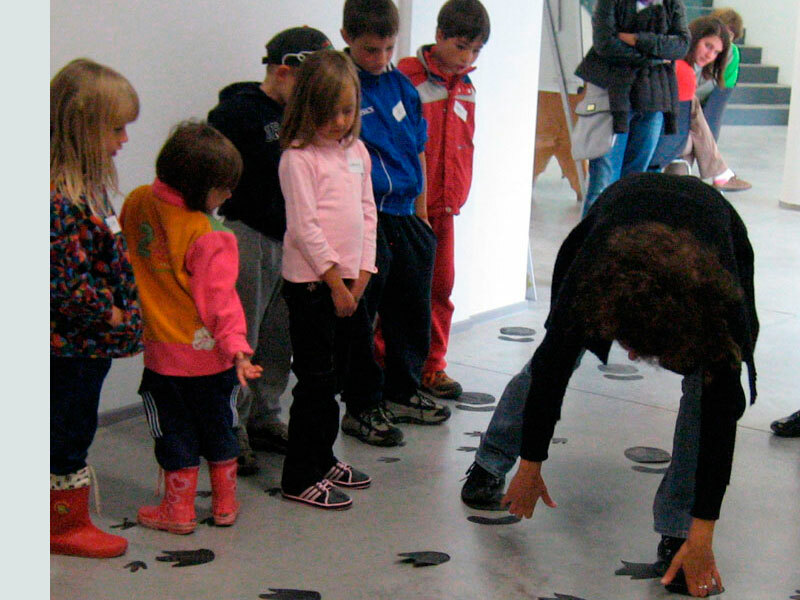 Animated tour introducing children to the reality of the museum through games and manual activities with which to discover the boulder of the Pelmetto and its dinosaur footprints and the men's camp of the Mesolithic period in the basin of Mondeval. 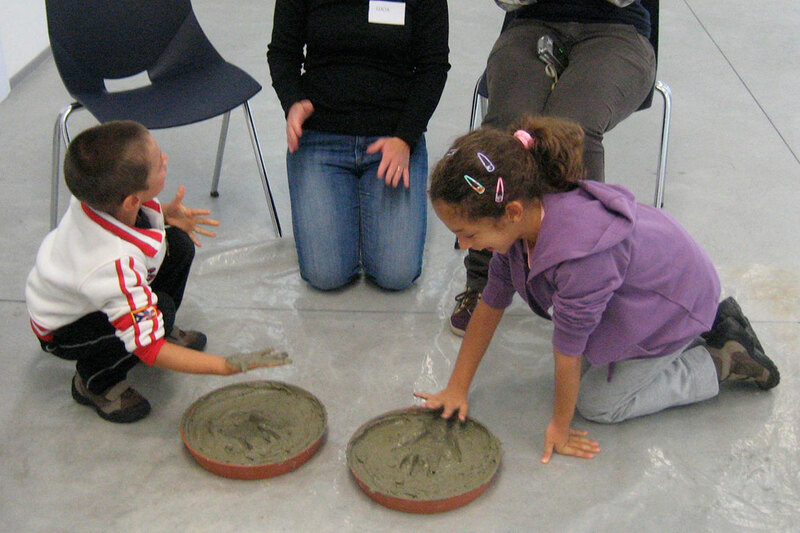 After an introductory and evocative journey through time (the origin of the Earth to the Upper Triassic dinosaurs to the present day), children will be invited to print their foot and hand on the clay and, from these to understand how the prints of the Pelmetto were formed. 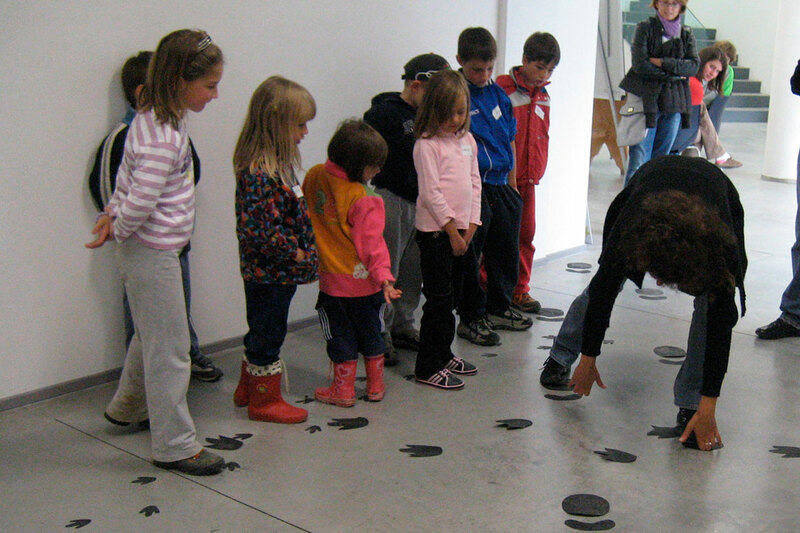 Later, with the help of small dinosaurs, the young visitors will find the tracks, reproduced and well identifiable, for each species and will give them a name and an image. 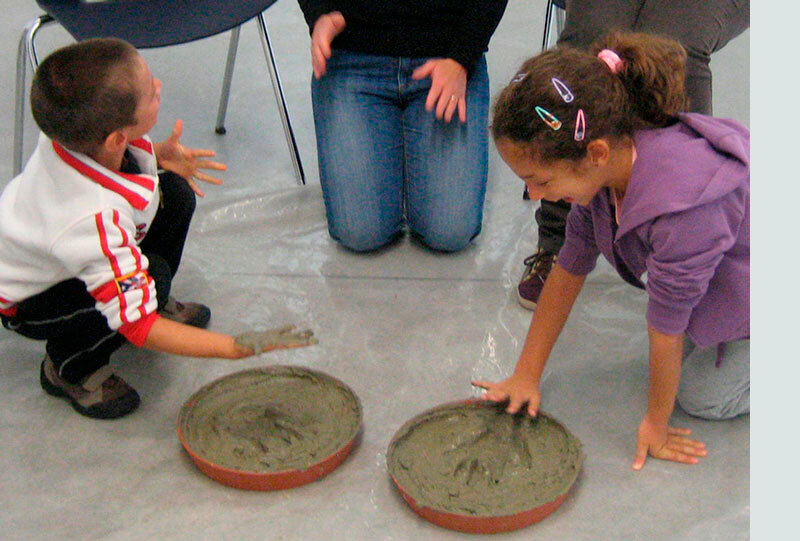 After an introductory and evocative journey through time (the origin of the Earth to the Upper Triassic dinosaurs to the present day), children will be invited to print their foot and hand on the clay and, from these to understand how the prints of the Pelmetto were formed. Later, with the help of small dinosaurs, the young visitors will find the tracks, reproduced and well identifiable, for each species and will give them a name and an image. Later, young visitors will gather tracks, reproduced and well identifiable, for each species with the help of an identity card of each dinosaur and will give them back a name and image. The fossils have always fascinated young and old: how did the shells or fish end up there on the mountain tops? And how does a living organism, animal or plant, become a piece of rock? This experience at the Museum "V. Cazzetta" will give an answer to these and many other intereting questions abour the world of fossils. After a visit to the museum, focused especially on the Mesolithic section, the children will be able to touch the tools and objects in the kit of the Man of Mondeval.They will reconstruct the skeleton and replace the kit of the Man of Mondeval correctly in the reproduction of the pit from the drawings made by archaeologists during the excavations. A "taphonomic card" used to describe a burial site in a precise and scientific way will be given to each participant. Firstly the laboratory will introduce the children to the concept of excavation as one of the most important archaeological survey of a site for the recovery of artefacts and collecting all possible information. Then they will be helped to understand the meaning of modern archaeology: an increasingly multidiscipinary science: the archaeologist in fact works together with a group of specialists from various fields of the natural sciences. 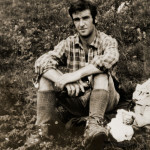 Then the participants will come to discover that the archaeologist is not only the figure who dusts off the ground to collect antiques at an archaeological site, but he/she must also be able to understand how this soil that he/she is digging may have formed (the archaeological deposit) and recognizes individual stratigraphic units. The workshop provides an introduction to explain the concept of fossilization and where to acquire essential skills for the recognition of fossils. You can also discover and understand the main evolutionary processes that have led to the development of forms of life we know today. It will focus mainly on fossil species spread across the Dolomites with special attention to those exhibited in the museum. Subsequently, thanks to recognition cards, you will identify and recognize the real fossils provided. After a thorough introduction clarifying the concept of fossil fossilization and when you will acquire essential skills for the recognition of fossils, you will also discover and understand the main evolutionary processes that have led to the development of forms of life we know today. The activities will focus mainly on fossil species spread across the Dolomites with special attention to those exhibited in the museum. Subsequently, thanks to recognition cards, you will identify and recognize the real fossils provided. The workshop is focused on a real archaeological excavation that will be played in the museum teaching area. The children will be directly involved in the analysis, documentation and the excavation of a stratigraphy especially made for the purpose. They will apply the techniques of stratigraphic excavation, documentation graphics on graph paper and notebooking on the excavation and will perform a first treatment of the artefacts themselves (washing, inventory and first interpretation). They will then proceed to the elaboration of the long journey from the land of the findings to the museum: from the restorer’s work to the creation of an inventory by the archaeologist and, finally, the museum display of the findings. a group class for each teaching assistant (minimum 15 people - maximum 30). Cost of educational activities including entrance: 10 € per child. To book please call +39 329 4757082 or send an e-mail: prenotazioni®museoselvadicadore.it. Any cancellation must be notified at least one week before the booked date.